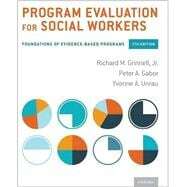 by Grinnell, Richard M.; Gabor, Peter A.; Unrau, Yvonne A.
Richard M. Grinnell, Jr. is Professor and holds the Clair and Clarice Platt Jones/Helen Frays Endowed Chair of Social Work Research at the School of Social Work at Western Michigan University. Peter A. Gabor is a Professor at the Faculty of Social Work at the University of Calgary. Yvonne A. Unrau is Professor at the School of Social Work at Western Michigan University.